If you need to send money to Sweden but you are frightened by the big fees charged by banks, be sure to read this Sweden Money Transfer Guide. We will show you how the Top Foreign Exchange companies reward their customers with zero fee transfers, great currency exchanges, quick delivery and awesome customer support. Embrace the technology and forget about your local banks by making cheap and easy money transfers from the comfort of your own home. Currencies Direct helps customers make cheap money transfers to Sweden by providing a great exchange rate for any currency you may have. More than that, they have a very low minimum of only 100 euros and have no restrictions as far as the maximum amount to be transferred goes. WorldFirst is a company that has been focusing a lot on creating the best and easiest to use service by its clients. There are a few FX companies that tapped into the mobile app sector but none comes close to the WorldFirst mobile app. It is very intuitive and easy to use and at the same time, provides all that is necessary in order to make international money transfers with just a few taps. There are no restrictions on inbound or outbound money transfers in Sweden and this means that any company that provides money transfer services can do so in every region of the country. Currencies: MoneyCorp works with international clients every day so having a big number of currencies is a must. Because they trade between many currencies, you can easily make transfers to European countries that are using Euro as their main currency like France, Spain, Germany, Cyprus, Austria, Belgium and many more. The primary currency influence is the domestic economic cycle. Given high exports and strong international trade links, global economic swings are also important for short-term krona trends. Prior to 1993, the central bank was not independent and the government struggled to maintain financial stability with a severe banking crisis. There was a move to inflation targeting in 1993 and the Riksbank, granted independence in 1999, now has a mandate from the government to maintain price stability with an inflation target of around 2%. This is a similar target to most OECD central banks and provides underlying currency support and should underpin long-term stability. The krona will tend to strengthen when the Riksbank is tightening policy to keep inflation low and tend to weaken when the central bank is cutting rates. Although there is a floating exchange rate regime, the Riksbank does act to influence the exchange rate if currency trends are having a major impact on inflation through excessive weakness or strength. The Swedish current account has been in surplus since 1993 which provides underlying currency support. Sweden has a high ratio of exports to GDP with exports concentrated in the primary and engineering sectors. The economic performance and currency trends are, therefore, correlated strongly with overall trends in the global economy. Given close links to Norway, there is also some sensitivity to oil prices. Sweden is the seventh-richest country in the world in terms of GDP and offers a high standard of living for its citizens. The country has an export-oriented economy with the engineering sector accounting for 50% of output and exports. Real Estate: In 2016 Sweden has seen an economic boom as a result of a cocktail of record central bank stimulus and unprecedented immigration. Low-interest rates have boosted consumer spending and borrowing, with house prices rising to new all-time highs. Combined with the fact that the country is battling a severe housing shortage, Sweden is seen as one of the go-to countries for real estate investors in 2016 and beyond. Startup Hub: The Telegraph named Sweden in 2015 as the “Startup Capital of Europe” because of the fact that it is the world’s second most prolific tech hub on a per capita basis, behind Silicon Valley. And with the like of Skype, Spotify, Candy Crush and Minecraft being started in this country, you might start to understand why it got this name. Sweden has a lot of safety nets from an income perspective, which reduces the risk of starting your own company. Free education: Even university studies are government subsidized. Work benefits: Five weeks paid vacation to start and 480 days of paid parental leave. Go green: Sweden is a very environmentally conscious country and so are the people. Big taxes: Sweden has some of the biggest taxes on revenue. Climate: Most people are a little reluctant about the wintertime in Sweden as the temperatures can get pretty low in the northern part of the country. Immigration: Immigration can be quite hard and many boxes have to be checked before applying for a visa. Popular cities for business and real estate transactions in Sweden are: Stockholm, Gothenburg, Malmo, Uppsala, Västerås, Örebro, Linköping, Helsingborg, Huddinge and Jönköping. Send Money to Sweden: Companies that provide international money transfers to Sweden. Send Money from Sweden: Companies that take on Swedish Customers. After joining the European Union (EU) in the early 1990s, Sweden has allowed for free movement of capital to and from the country. The only industries that are somewhat protected from foreign investments are fishing, insurance and air transport. 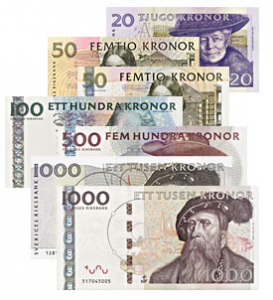 The Swedish krona is freely exchanged with any other currency, with the most often exchanged being the US dollar and the Euro. The Finansinspektionen, maintains direct oversight and regulation of the financial system, including banks, insurance companies, payment institutions, and other financial service providers. Sweden is very open to foreign investments and that’s why it is a popular location for investment. No transfer restrictions are in place, nor do transfers need to be officially declared. Only transfers over EUR10,000 per person must be declared. Swedish residents are taxed on any foreign income. Non-residents are taxed on any income originating in Sweden.